A temporary workshop in two containers has been formed for maintenance of PIA aircraft at new Islamabad International Airport. 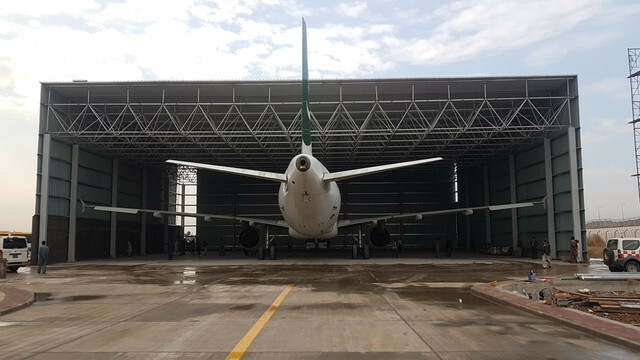 RAWALPINDI: A new aircraft engineering hanger with an ability to accommodate ATR and Airbus A320 will be completed at the new Islamabad International Airport soon. The junior most staff member of the Pakistan International Airlines (PIA) is expected to inaugurate the hanger. The engineering hanger at the old airport in Rawalpindi did not have the facility to cater to A320 aircraft which was also causing huge revenue loss to PIA as airplanes had to be flown to the Jinnah International Airport in Karachi for maintenance and repair work. The airline`s flight schedule also experienced disturbances due to this. The new hanger at Islamabad International Airport will be opened for business in the next few days. It is being built at the apron`s domestic flights side and engineers have been working round the clock to ensure its early completion. A technical ground support area where tug masters, toe bars, stairs, tractors, water cans and waste containers are stored is also under construction at the new airport. 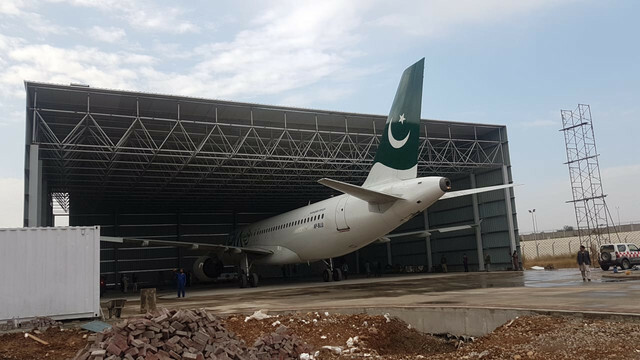 PIA new maintenance hangar at Islamabad Airport. Hanger built for A320 & ATR. You can see an A320 in it. ^ Thank you Jamshed for sharing photos. Is hangar inaugurated and operational now? As of my info, hanger still under construction and possibly getting final soon. This A320 was docked for test purpose. ^ Thank you for the info. RAWALPINDI: Pakistan International Airlines (PIA) is expected to inaugurate its new aircraft engineering hangar at the Islamabad International Airport (IIA) by the end of this month. However, the new hangar is yet to be named. According to sources, two names for the engineering hangar have been proposed. It will either be named after Air Marshal Nur Khan, former chairman PIA, or Asim Waqas, PIA engineer who lost his life in the Dec 7, 2016, ATR plane crash near Havelian. The hangar will have the ability to accommodate ATR and Airbus A320. PIA Chairman Air Marshal Arshad Malik has directed the authorities concerned to complete the hangar as soon as possible. He has also said the most junior staff member of the airline would inaugurate the hangar. In May 2018, the Islamabad International Airport was inaugurated by the then prime minister Shahid Khagan Abbasi. But the airport lacked the facility of an engineering hangar. The newly-built hangar is equipped with the most sophisticated machinery and other equipment to repair or maintain ATR passenger planes and Airbus A320. In addition, executive jet aircraft will also be maintained at the hangar. The engineering hangar at the old Benazir Bhutto International Airport lacked the facility of maintaining A320 aircraft which was causing huge revenue losses to the airline because the airplane needing maintenance or overhauling had to be flown to the Jinnah International Airport Karachi. Due to shifting of the airplanes to Karachi, the airline`s flight schedule got disturbed besides other operational problems. 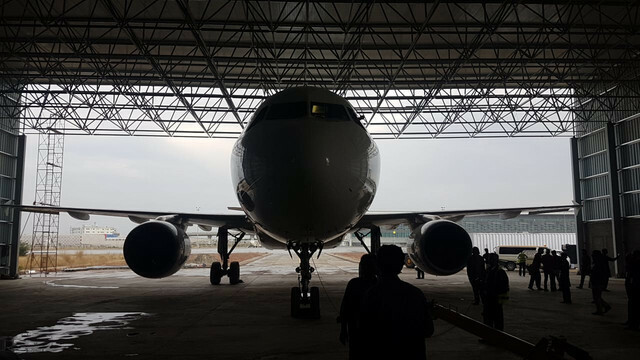 The airline authorities believe that after the opening of the engineering hangar, the flight schedule regulation will be better. The engineering hangar at the Islamabad International Airport is expected to be opened on Nov 29 or 30. When contacted, a PIA spokesman said Air Marshal Malik wanted the engineering hangar to be completed as soon as possible. It is expected that the hangar will be completed by the end of the current month, he added. RAWALPINDI: The Pakistan International Airlines (PIA) will vacate the old Benazir Bhutto International Air Port (BBIAP) after shifting its technical ground support (TGS) equipment to the new airport on Tuesday. According to sources, in coordination with different departments PIA has made arrangements for removing its equipment and 10 vehicles along with office furniture still lying at the old airport since the Islamabad International Air Port (IIAP) was made operational in May this year. The sources said heavy vehicles would start the shifting process at about 8:00 AM on Tuesday and complete it by evening. PIA had started its international flights at BBIAP in 1963 while VVIP and VIP lounges were constructed at the airport in 1972. The expansion and renovation of the airport was carried out in 2015. Known as Chaklala Airbase since its establishment in 1930, the airport was named after PPP chairperson Benazir Bhutto in 2008. After the IIAP started operations, PAF authorities took control of the old airport. However, the old airport is still being used for VVIP and VIP flights. 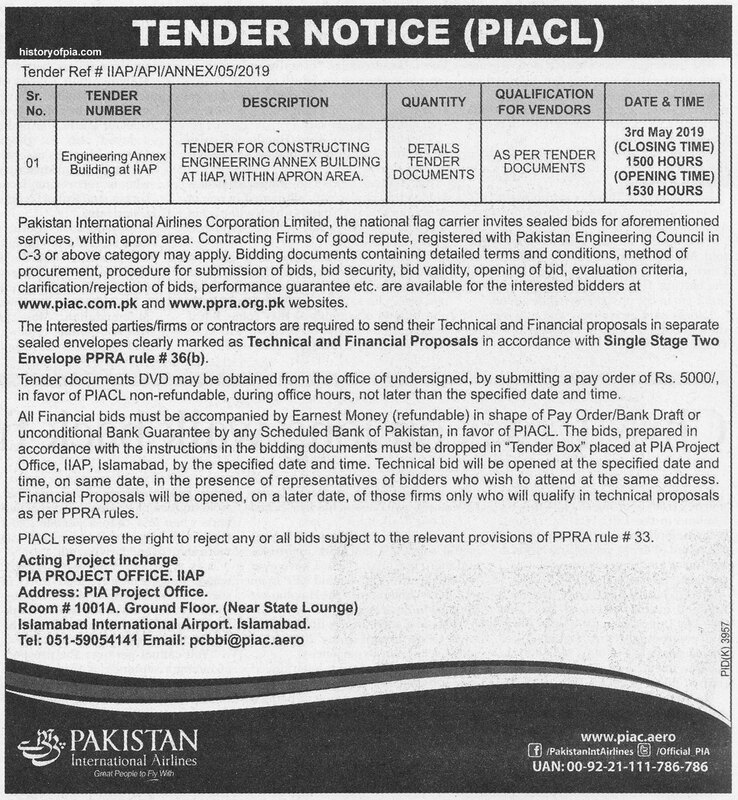 PIA tender notice in April 17 newspaper for the construction of engineering annex building at Islamabad International Airport within apron area.